The Reds started their “March To The Arch” by defeating old foes, Faversham Town in an FA Cup 1st Qualifying Round tie down Salters Lane. While The Lilywhites featured seven of the team – as well as the Manager – that were beaten in the Division One South Play-Off Final three years ago, in their squad, including Captain from that famous day, Ryan Cooper, the visitors had just Ross Edwards remaining from their line-up on that balmy April afternoon back in 2015. 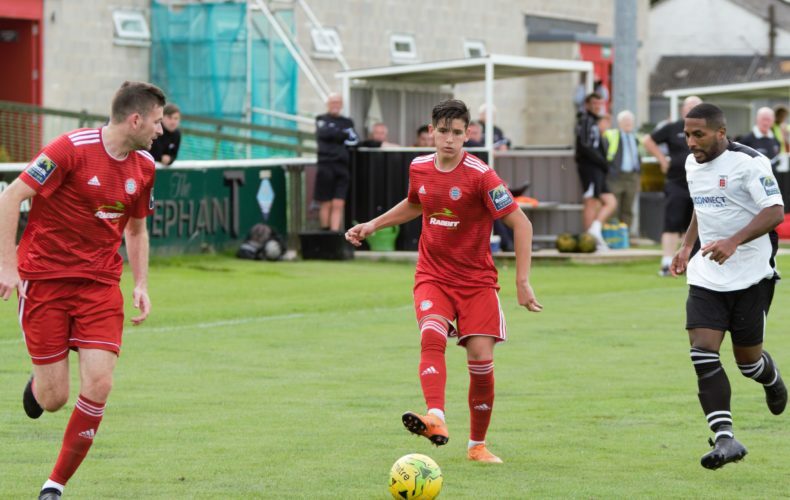 As if that wasn’t enough to stoke the fire of the home side, Dave Cook and Jack Harris both played for Hythe Town in the equally memorable semi-final ! 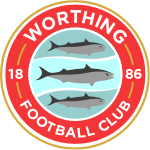 Manager, Adam Hinshelwood, shuffled his pack for this cup tie by bringing Budd, Colbran and Rents back into the starting eleven, while having the luxury of resting Young, Barker and Parsons. 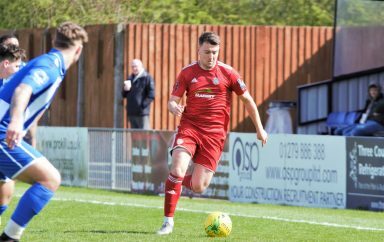 Ross Edwards also made a welcome return to the team, as Ovenden dropped down to the bench where he was joined by Ricky Aguiar and Hayden Skerry, in the other changes to last week’s win at Haringey Borough. The game started with Faversham first on the attack, as Dave Cook headed over the bar from a corner after only two minutes. The visitors hit back when Jesse Starkey went on a run which took him into the penalty area but, it was that man, Cook again who this time was there to deflect the shot behind for a corner. The match then drifted along with little to warm the crowd, until another corner was headed over, by Joel Colbran, after neat interplay on the right between James Crane and returning Captain, Darren Budd had brought about the set-piece opportunity. Two minutes later though and we had our opening goal of the afternoon. Starkey’s left-wing cross found Crane, up on the right, who played a pass into Budd and he hit a first time shot into the back of the net from eighteen yards, despite goalkeeper, Simon Overland getting hands to it and the presence of Cook on the line. 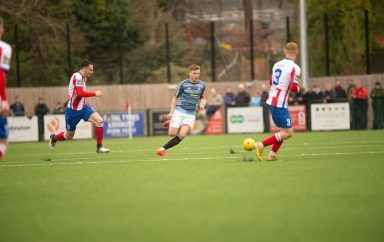 The Kent hosts had a chance to equalise from a free-kick in a dangerous looking position outside the box but, Danny Walder could only find the safe hands of Lucas Covolan. A long ball from Aarran Racine picked out Ricky Aguiar – on early for the injured Jazz Rance – but his delightful flick over the head of Ryan Cooper, sadly wasn’t matched by the finish. With half-time fast approaching, another right-wing delivery from Crane saw both Aguiar and Starkey unable to get enough purchase on their shots, as the visitors tuned up the heat. Then, in time added on, David Ajiboye missed the target by inches at the end of a marauding run, Callum Kealy came equally close with his header from yet another Crane cross and, finally, Ajiboye broke down the middle and sprayed his pass out to Starkey on the left. His subsequent ball into the box was headed away by Renford Tenyue and cleared slightly further by Walder but, only as far as Budd, whose long-range effort was held by a diving Overland. The second period was only a few minutes old when George Monger’s corner on the left went over everyone’s head and left Matt Bourne with a simple tap-in at the far post. Parity didn’t last long though, as four minutes later, Aguiar, on the right, played in an overlapping Crane, who broke into the box and laid the ball back to Kealy, lurking menacingly near the six yard box and he touched it on to top-scorer, Ajiboye who turned home his fifth goal of the season. It was the former Brighton striker who came close to making it three, when he curled his shot wide of the right-hand post, from marginally outside the area. Starkey then headed wide of the other upright before Crane got the goal he so richly deserved. The wing-back cut in from the right and found the far,bottom corner via a deflection off the unfortunate Cook. The final fifteen minutes produced little of note, other than Faversham substitute, Luke Griffiths seeing his shot go out for a corner while, up the other end, Budd had time and space, around twenty yards out but, failed to hit the target. With eighty five minutes on the clock and, with one last throw of the dice, fellow replacement, Ashley Miller put in a cross that was headed behind for a corner. Sadly, for the men in White, the accompanying flag-kick only resulted in a comfortable catch for Covolan.